Not your typical bar. Big comfy booths, plasma TVs, high-end comfort. A cuisine that ranges from fried calamari, to hamburgers, to Eggplant Fiona. A menu and attentive service that will leave you truly satisfied. 17th Streets website was static, outdated, and plain boring. 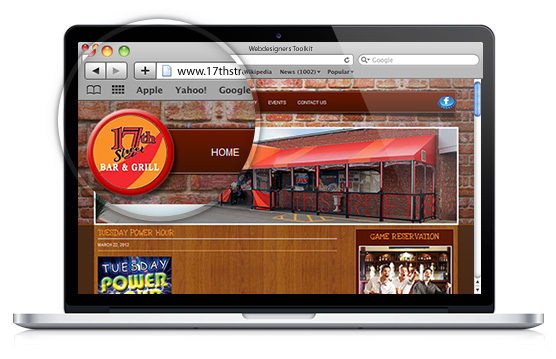 They needed something to truly portray the atmosphere of the bar as well as make it easy to edit the site themselves. OMA comp built the new 17th Street website on top of WordPress so changes can be made quickly and easily. Menu items, pictures, and events can now be updated at moment’s notice. Bar atmosphere and web design at its finest.